Seeing as Halloween sadly falls on a Monday this year, there's a good chance you've already busted out your costume for house parties, bar crawls, and other festive events over the weekend. But thanks to Krispy Kreme, it looks like you've got another great reason to dress up like a slice of pizza or walk around in a sloth onesie on the actual holiday: free donuts. 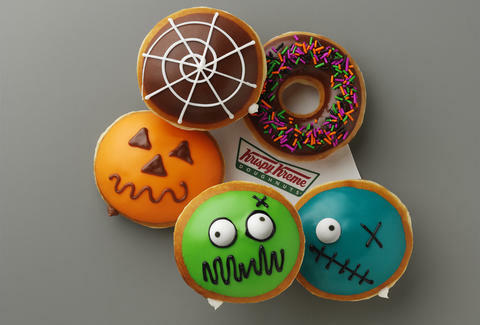 Just like last year, Krispy Kreme will give you one free donut of your choice -- including one of its new Zombie donuts (shown above) -- if you show up to any participating location in the US and Canada wearing a costume on Halloween. The offer is good for one donut per person and lasts all day on October 31st; however, it excludes Krispy Kreme shops in Connecticut, Iowa, Nebraska, and Gainesville, Florida as well as grocery stores and convenience stores, according to the company's official Facebook event for the promotion. Best of all, you don't even have to buy anything. Sure, one free donut isn't exactly worth taking the time and effort to throw together a last-minute Halloween costume, but if you're already dressing up for the occasion -- perhaps to take advantage of Chipotle's $3 burrito deal -- then swinging by your local Krispy Kreme for a Zombie donut seems like a no-brainer. Certainly beats the hell out of settling for candy corn. Tony Merevick is Cities News Editor at Thrillist and could go for a nice glazed donut right about now. Send news tips to news@thrillist.com and follow him on Twitter @tonymerevick.